This activity gives students a way to look at how organisms are connected to ecosystems through the cycling of matter and the flow of energy. By the end of the activity, students will be able to make distinctions between how matter and energy are used and transferred and will be encouraged to apply this important crosscutting concept to the world around them. First, students observe an animal, then they reflect on how it uses matter from food to build body structures and energy from food to do things. Students look at food as “packages” of matter and energy that animals (and plants) consume. They also think about wastes, such as poo, pee, sweat, heat, and carbon dioxide. 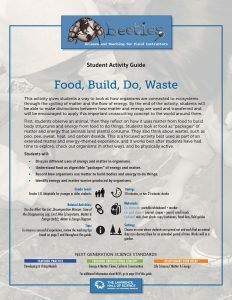 This is a focused activity best used as part of an extended matter and energy-themed experience, and it works best after students have had time to explore, check out organisms in other ways, and be physically active. Discuss different uses of energy and matter in organisms. Understand food as digestible “packages” of energy and matter. Record how organisms use matter to build bodies and energy to do things. Identify energy and matter wastes produced by organisms.